Transferring Property into Joint Tenancy | The Law Offices of Eric A. Rudolph P.C. Transferring property into joint tenancy is a great way to avoid probate of real property. Any two people, be it spouses, parent/child or even two friends, can take title of real property as joint tenants with right of survivorship. This means that when the first joint tenant passes away, the surviving joint tenant receives the property as a matter of law. The surviving joint tenant does not need to go through probate or any form of estate administration to transfer to the property. If you own real property in your name alone and want to make sure it goes to someone else without going through probate, joint tenancy may be the answer. By preparing and filing a deed with the county recorder’s office in the county where the real property is located, you can ensure that when you pass away the property will go to the other joint tenant as long as the other joint tenant survives you. However, there are some important things you should consider before adding another person on as joint tenant. If your joint tenant has any creditors trying to collect against them, your property could be subject to those creditors. If your joint tenant has a judgment against them, your property could be subject to that judgment. And if you want to sell the property or get a loan against the property, you must have the other joint tenant’s permission first. 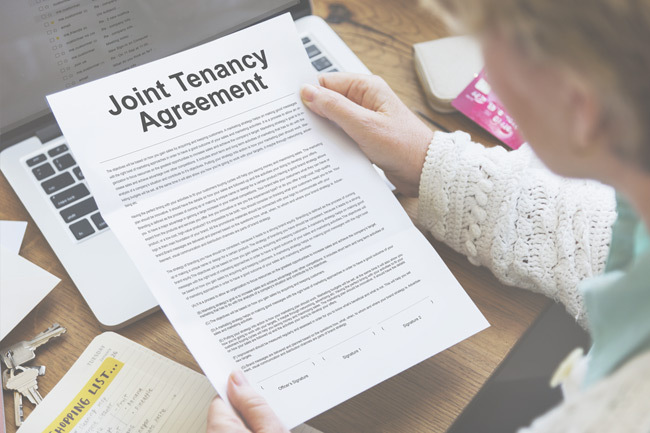 So do not just add someone on as a joint tenant without first weighing the risks against the benefits of using joint tenancy as a way to avoid probate. The Law Offices of Eric A. Rudolph can advise you on transferring property into joint tenancy and help you prepare and file the deed, as well as the additional documentation needed, to get your real property officially transferred from you to you and another person as joint tenants.